The East Side Freedom Library is hosting a community discussion about the four murals in the chambers shared by the St. Paul City Council and the Ramsey County Board. 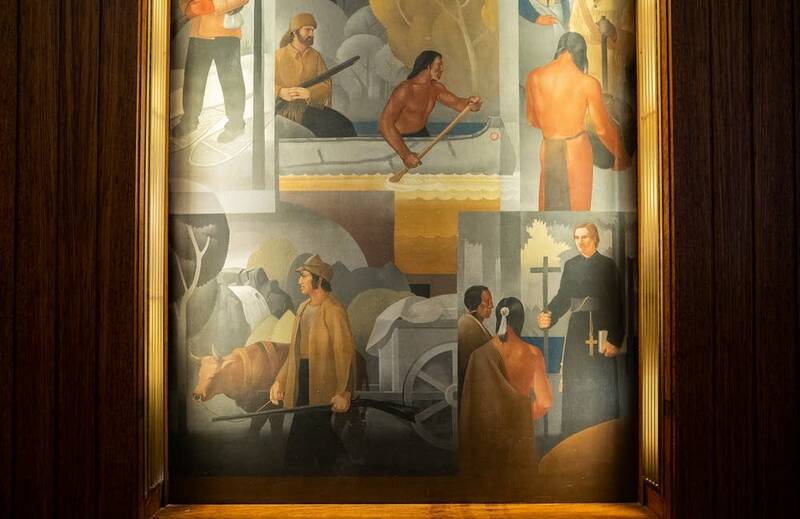 These Depression-era murals have been controversial because of how they portray our history. They have images that are not welcoming to all members of the community, including a priest towering over Native Americans and converting them. The community discussion will be held at the library, 1105 Greenbrier Street, St. Paul, on Thursday, Jan. 10, from 7 – 8:30 p.m. St. Paul City Council Member Jane Prince (7th Ward) and Ramsey County Commissioner Jim McDonough will participate. The event is free and open to the public. Here is the Facebook Event Page to share. Image from a portion of one of the four murals. Note the priest converting Native Americans, bottom right. The four sequential murals highlight explorers, treaty signings, and business development — starting with the wild landscape and images of Native Americans. These fade away and the final mural shows images of buildings, commerce, and modernity. This debate is no different than recent controversies about problematic Robert E. Lee sculptures in the south or the debate over the historic paintings in the Minnesota State Capitol. Here is the Facebook text for the Jan. 10 event. For the past several years, discussions, debates, and actions have swirled across this country about the ways that our complex past has been represented by monuments, memorials, paintings, and place names. While often contentious, these discussions can serve a valuable educational function: that of making more of us better-informed about our history and its long-term consequences. These discussions can also help us to consider what we can do to make sure that our public spaces are welcoming to our neighbors as well as ourselves.